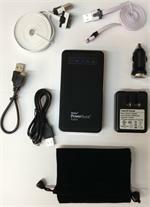 PB-12000: 12,000mAh Li-ION Power Bank. 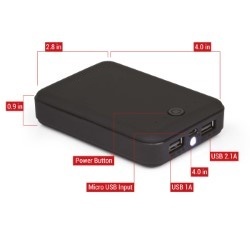 Size is 4" x 2.8" x 0.9" - compact, lightweight, sleek & powerful. It has dual USB outputs - 1A and 2.1A. 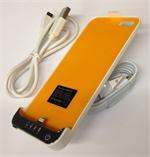 It will charge SmartPhones, Tablets, Cameras, GPS, Music Players, etc. 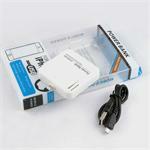 Has handy micro USB charging port for recharging of itself when necessary - hook up to computer or USB wall AC-DC. 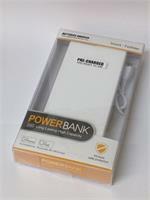 Includes on/off power button and handy LED flashlight feature.